I recently attended a presentation by the Dubai Department of Tourism and Commerce Marketing (DTCM) to the Middle East PR Association (MEPRA) regarding the city’s biggest community campaign to date – #MyDubai. As a passionate travel blogger, who earns a living through communications and is therefore rarely out of social media, and who loves the city I live in, it would have been impossible for me not to notice the #MyDubai trend sweeping across the networks, but there seemed to be very little steering from official sources, and I now understand why. The campaign was not part of any prescribed strategy by Dubai Government, it was an initiative launched by Sheikh Hamdan, the Crown Prince of Dubai, with the objective of celebrating life in Dubai and creating the world’s first city autobiography – a living, breathing multimedia exhibition documenting a year in the life of Dubai. The initiative was never designed as a way of broadcasting Dubai’s message to the world, it is smarter than that, providing a platform for contributions from within the community, allowing them to take ownership of their city and help market it to the world. The initiative supports Dubai’s tourism vision for 2020 – for the city to welcome 20 million visitors and treble the contribution of tourism to the economy by 2020 – not actually such a scary statistic when you consider that tourist numbers have already doubled from 2004, to 10 million guests in 2012, and that we are now the eighth most visited city in world. Currently Dubai attracts the most visitors from Saudi Arabia, India and other GCC Arab countries, with the UK and the US in the top five. As a destination that appeals to business travellers as well as families, and is well equipped for events, we have a lot of repeat visitors from around the world, and the challenge now is not only to keep those people coming back, but also to increase the numbers. There are a number of plans already in place, including enhancing and expanding the mid market segment for hotels, to provide a wealth of options beyond the traditional luxury offering. The savvy hotels are also realising the potential and arranging specific promotions that tie in with Russian, and increasingly Indian, holidays as these source markets continue to grow. In order to appeal more to families (and achieve the objective of becoming the world’s leading family destination), plans for Dubai tourism include creating bigger hotel rooms, more apartments and holiday homes, as well as continuing to launch new attractions and theme parks, thereby enhancing the city’s offering to families. But it’s not just families who flock to our sunny shores, Dubai is already recognised as a regional events and business hub due to its optimal geographical location in relation to the rest of the world, the safety and security of the UAE within the region, and the highly developed infrastructure. The strategy now is to develop and maximise this positioning to create leading events destinations, in terms of sports and music for example, making Dubai a place that people will travel to in order to see a concert or watch a game/match/race. Basically, there has been a shift in the messaging for Dubai, once (and still) known as a city of superlatives with renowned awe-inspiring landmarks, the narrative is now changing and broadening: From a city to see, to a city that people must experience. These experiences also have to be localised and developed for each market, with some maintaining the superlatives – as an example super cars appeal to the KSA market, but not at all to the UK market; the beaches appeal to Russians, but not Australians; the gold appeals to Indians, but for the Chinese it is only the experience – to stay in Burj Al Arab for one night and spend the rest of the time in a three star hotel in Barsha. 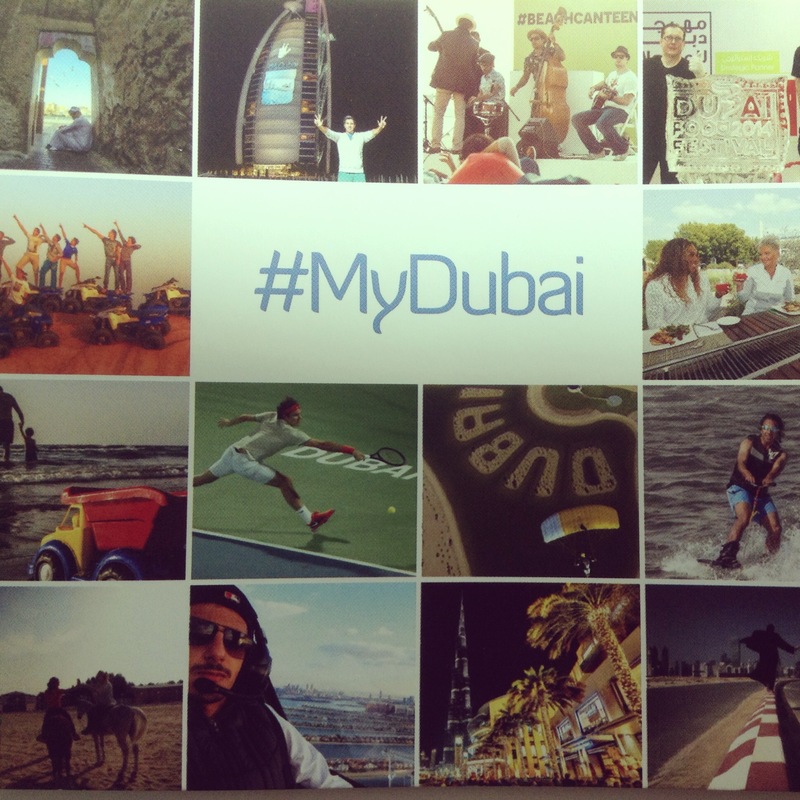 The #MyDubai campaign supports this message shift by sharing experiences, beyond the landmarks, and takes advantage of the new trends in destination marketing, i.e. the increasing use of social media, leveraging of user-generated content, the use of real and interactive experiences, creation and sharing of emotional experiences, and the continuing increase in importance of third-party approval and endorsement (according to stats shared by DTCM from Webbed Feet, 52% of Facebook users say their friend’s photos inspire their travel plans). We had a look at several great examples of similar campaigns such as #MeetSouthAfrica, Montreal Insiders, Greater Philadelphia’s Instagram, and L.A. Best Places, all supporting the same rationale: that the best marketers of a city are those who live in it – the residents are the brand. Following Sheikh Hamdan’s launch, DTCM are now supporting this growing movement, creating the platforms that will allow 2.1 million people of over 200 nationalities to create one story that touches millions of people around the world. The growth however has been organic, with companies and businesses adopting the hashtag and including it in their own advertising and marketing, and promoting it at their own events, in addition to the recognition and support from Dubai’s celebrity fans, such as Roger Federer. This campaign is going from strength to strength, fuelled by the passion of the people living in Dubai. It has so much mileage beyond social media too, in terms of creative offline platforms – events, advertising, merchandising and community outreach. Dubai is no longer focussed on the city of the future, now it’s about showing the city of today. There are talks of launching a short film competition, showing the content in the airports (to show those in transit the city they’re missing), creating social walls in key locations, and of ultimately creating a unique travel guide by the people for the people. All very exciting stuff, and a great way for Dubai to yet again lead the way and continue towards its ultimate goal of becoming the world’s leading family destination.